Another happy, healthy dinner via the Health Starts Here Supper Club, this one held in the dim and intimate wine cellar of Whole Foods Torrance. The dinner marked the start of the Whole Foods Eat Right America 28-day health challenge, where participants work on changing their eating habits (and going mostly vegan) and exercising. 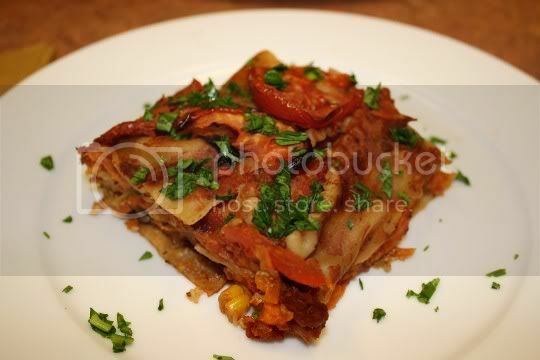 For only $15, diners enjoyed a five-course meal of recipes adapted from the Eat for Health and Engine 2 Diet books. What does that mean? Well, the meals contained no salt, no oil, and are 100% vegan! This super unique (and healthy) take on an Italian classic was surprisingly amazing. Instead of a bread base, slices of zucchini and squash held the traditional tomato and basil salad...and it was really good! 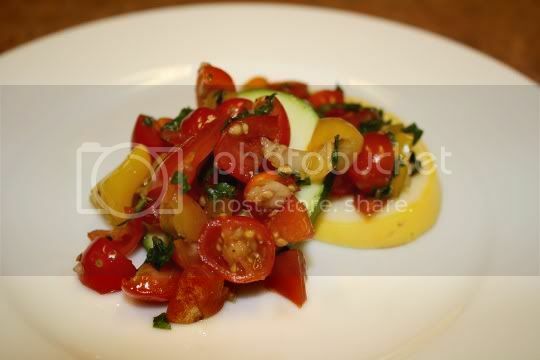 Yellow and red cherry tomatoes were combined with balsamic vinegar, garlic, fresh basil, black pepper, rosemary, and just a hint of red pepper flakes for some bite. Seriously, I didn't even think twice about the bread. It was so light and summery, so refreshing, and so tasty. This would make a great starter or finger food. I dare you to try it...after all, who needs all those carbs?! Another great finger food idea, this pizzette had every texture and taste you'd need in a savory dish. The organic flaxseed Flacker was used as a base, and its hearty, crunchy, sturdy texture really was great with the topping ingredients. 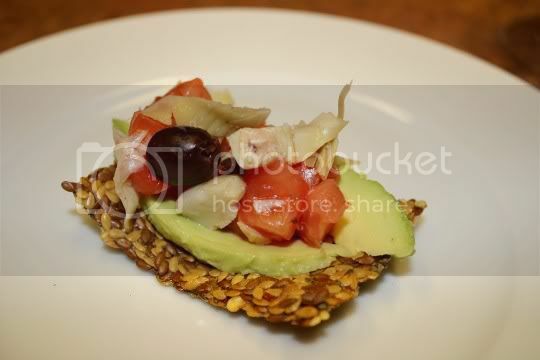 Sliced avocado, tomatoes, artichoke hearts, and kalamata olives provided an ultra Mediterranean flavor, and the artichoke and olives made the use of salt or oil completely unnecessary. I normally don't even like olives, but it was a great flavor substitute for the salt. Believe it or not, this was my first time eating RAW kale. Now from my understanding, there's a "proper" way to eat this stuff raw: the leaves must be "massaged" and/or tossed with lemon juice to sort of tenderize the leaves. Otherwise, they'll be very tough, hard, and chewy. Unfortunately, I don't think these raw kale leaves were properly prepared...but the idea for this salad definitely had potential. Tossed with the leaves were chopped Braeburn apples, walnuts, raisins, celery, and carrots, and all of this was lightly coated in a simple Dijon mustard-vinegar-lemon juice dressing. 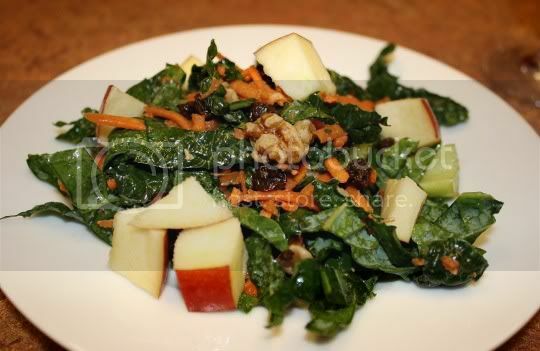 Aside from the extra plant-like taste and texture of the kale, all of the other ingredients worked well together, especially the sweet bursts of the raisins and the fresh, crisp apples. Traditionally, a waldorf salad is coated in a creamy dressing, so I would have liked to have some Vegenaise included. For such a health-conscious meal, this turned out to be a surprisingly hearty dish. Whole wheat noodles were layered with sweet potato, corn, red bell pepper, broccoli, garlic, onion, and even a little tofu. There was even a surprising bit of sneaky heat from some cayenne. Sweet potatoes and tomatoes together, a combination I've never had, were actually very interesting...a bit of sweet, a bit of tangy, but a very flavorful, savory, and fall-inspired taste. The roasted Roma tomato on top was a great touch, and who doesn't like the deliciousness of roasted tomatoes? So tangy, so sweet, so chewy...the perfect topping. Now with a dish like this and all of these vegetable combinations, I DO think a little salt would have REALLY emphasized the flavors. But overall, it was good. An adapted recipe, this "brownie" was actually very cake-like. But boy oh boy, what a perfect way to end this meal. Using whole grain flour (which you could definitely taste the heartiness of), applesauce as a sweetener, and non-dairy chocolate chips, this brownie simply screamed "health!" in a strangely addictive way. It was dense, chewy, sticky, and super moist. 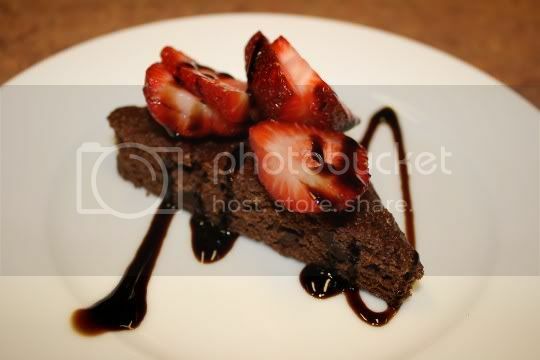 The additions of sliced strawberries AND a balsamic reduction upped the gourmet ante tenfold! Chocolatey, satisfying, decadent...and unbelievably low in fat and sugar! Yum. These dinners are definitely encouraging me to buy one of the aforementioned cookbooks, so I can start re-creating some of these amazing meals at home! 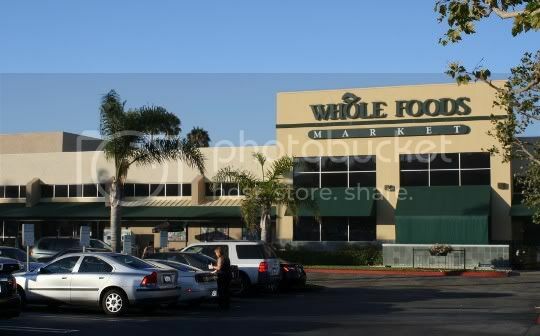 Thanks Whole Foods!